As I said yesterday, I decided to do my MAF (maximum aerobic function) heart rate test today at the track. I'm really glad I ended up doing my long run yesterday, because today's weather wasn't quite as perfect as yesterday's to run--but it was still very nice for July! To do the test, you just run 3-5 miles, preferably on a track, and keep your heart rate in the MAF zone (for me, that's 138-148). 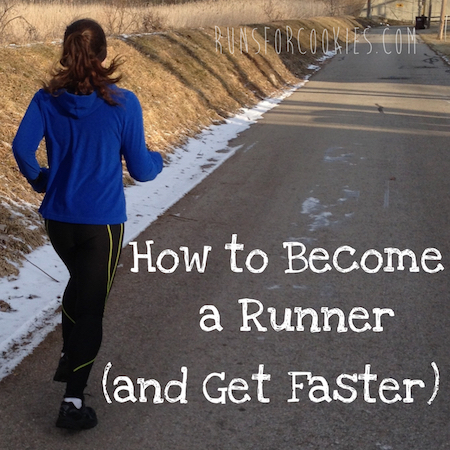 You keep track of each mile split, and each mile will most likely be slower than the last. This is pretty much the opposite of what I've always done! I usually try to get faster each mile, even though my heart rate is already up from the length of the run. In about four weeks, you do the test again, and if you train correctly (always in the MAF zone), then your mile splits should improve. I drove to the high school this morning, and I was disappointed to see a group of people there. I almost left, but I figured I'd ask if I could use the track. It appeared to be a football coach with about 10 high school boys, and they were doing drills on the field. The coach said there was no problem at all if I use the track, so I went ahead. Like I said yesterday, the hardest part about doing the MAF training is all mental--it's SO hard to run such a slow pace and force yourself not to speed up. When a bunch of high school boys are watching you run around the track, it's twice as hard not to run my fastest ;) But I was determined to stick with the "rules" of the MAF training, because I'm really curious to see if it works. So I shoved my pride aside and ran at a pace that felt painfully slow at times. After the first half-mile, my heart rate was hovering at 146 for most of the run. Occasionally, I'd hear a beep from my Garmin to slow down a little (usually when I passed by the guys who were training on one end of the field! ), but I immediately slowed down and my heart rate decreased. As if the football guys weren't bad enough, the running gods must have really wanted to test me mentally today. Two miles in, who else should come out to the track but the high school track team? I almost laughed out loud--I couldn't have picked a worse situation for me to do my MAF test ;) I almost called it quits at three miles, but decided to do four after all, which was my original plan. Despite the mental hurdle of trying not to care that those times are much slower than I'm used to, I actually really enjoy running at this heart rate. I honestly feel like I could keep running forever, and it's nice to not feel out of breath. We'll see how I feel about it after four weeks, though. I may get bored with the redundancy. I found it kind of interesting in the Hayden Institute article I posted about yesterday that the MAF test is predictive of race performance. For example, if your MAF mile is 10:00 (using a mile split that is at least a few miles into a run), then your pace for a 5K would be about 7:30 (once you are done with the base building period, it's okay to race hard and get your heart rate high). The slowest pace the chart lists is 10:00/mi, and my fourth mile today at MAF heart rate was 11:30/mi, so I'm not even on the chart yet. Based on last weekend's 5K (a 9:01 pace), I would guess that prediction to be fairly accurate. Anyway, it will be interesting to see what this training does, whether I get faster or slower over time. Today was day four of being back to counting points. Day four is always the hardest day for me--usually, if I can make it through four days, then I'm good at sticking with it for a while! And sure enough, today was really difficult. There were several times where I wanted to call it quits and just stuff my face, but I kept thinking about how I really didn't want to have to start all over from day one tomorrow, so I managed to get through the day. Someone left a comment on yesterday's post asking what my inspiration/motivation resources are. When I was being interviewed for the Half Size Me podcast, Heather asked me that question, and it was hard to come up with them on the fly. 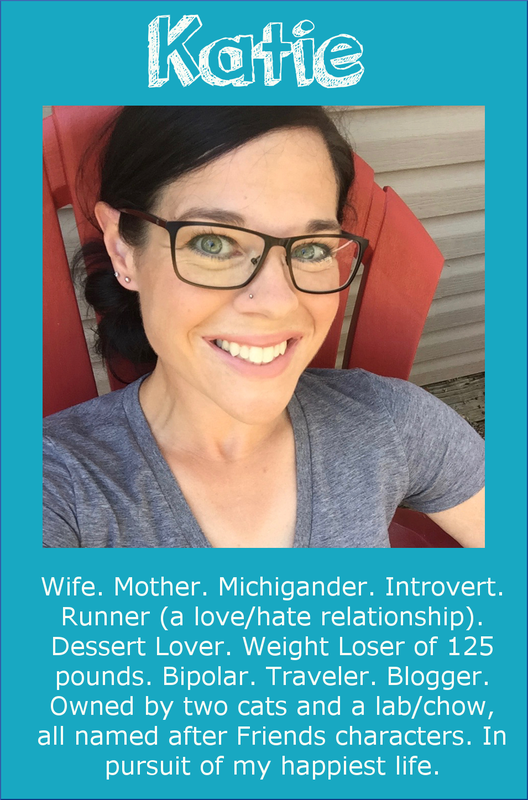 I mentioned SparkPeople.com, Runner's World magazine, and Weight Watchers. -Finally Thin! 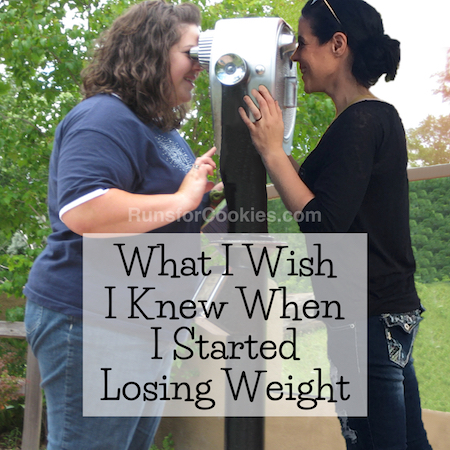 : How I Lost More Than 200 Pounds and Kept Them Off--and How You Can, Too by Kim Benson. 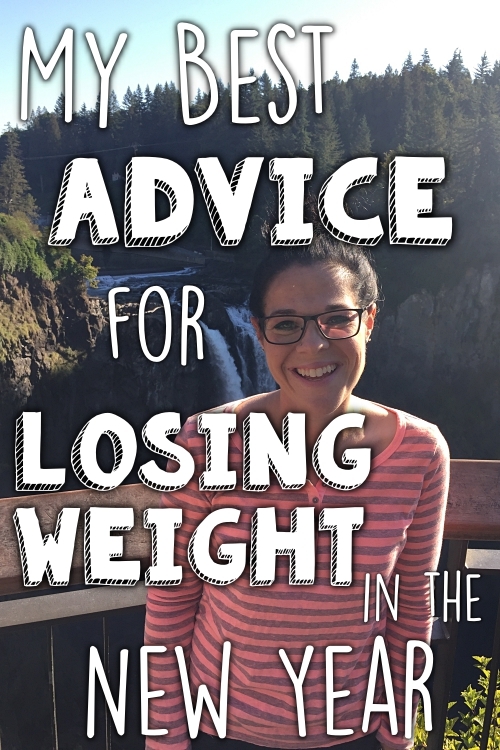 *Podcasts: My very favorite is Half Size Me (and not just because I was interviewed on it!). That's really the only one I listen to anymore. I used to listen to a few others, but since I stopped using headphones when I run, I don't really have an opportunity to listen to them. *I always feel inspired when I watch the show Extreme Weight Loss on NBC. That's really about all. I've learned that motivation only lasts for a very short time period; it's determination that gets you to your goals. But sometimes, when I'm feeling really on-edge, and thinking about bingeing, the sources I mentioned above are helpful in getting me through the moment. What made you stop using headphones when you run? I've been thinking about doing this because sometimes I worry about hearing loss but at the same time, I'm not sure I can get through a long run without the distraction. Any suggestions? I stopped using headphones after I took my RRCA certification class, because it was one of the "rules" we were supposed to follow as coaches. But I've never been very reliant on music to run--most of the time, I would have it on, but didn't really "hear" it (got lost in my thoughts, I guess!). Now, I never run with headphones, and on the couple of times I tried it, it actually kind of annoyed me. I like being very aware of my surroundings. I too read a lot of weight loss memoirs when I was losing weight. I feel a little sad now when I discover someone who has written a book has had a significant regain, like Frances Kuffel. 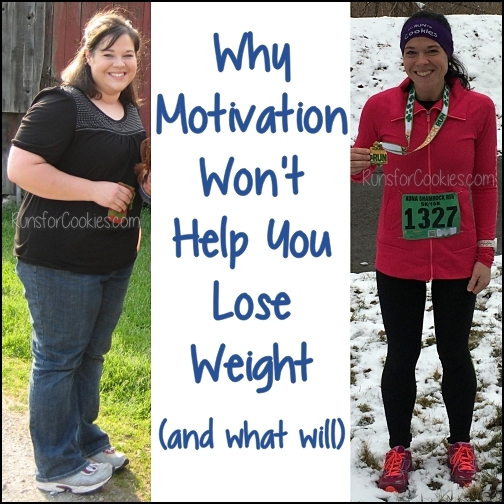 There are others too, people whom I considered real role models, who wrote wonderful books about their weight loss, and have since regained some of their weight. I guess it just proves how tough it is to keep ALL the weight off forever. I know I sure struggle with it, but when I come here every day, you help me stay DETERMINED! When you talk about running/walking a 5K with your boys, I can't help but remember that motivating factor that got you started when you couldn't run long enough to teach Noah to ride his bike. Now you're running with him. 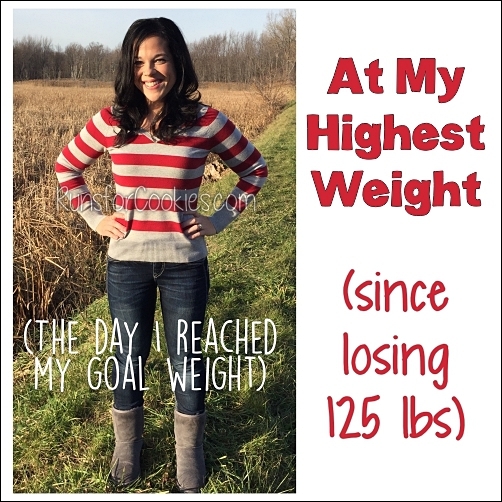 That has to be super satisfying, and by the way, you look gorgeous at both 130 lbs. and at 150 lbs., so don't beat yourself up too much. Bet those high school boys watching you run were thinking, "There's one HOT Mama!" I'm new to your blog and enjoying it! I really like that distinction between motivation and determination - I've never thought about it that way before but it's so true! I'm the same way with counting, only mine is the weekend instead of a specific day. Usually if I can make it through a weekend, I feel confident that I can keep going.